The incidence of adnexal masses during pregnancy is 2% (123). Adnexal torsion, which is more common during pregnancy, occurs in about one in 1800 pregnancies (34,124). Most adnexal masses discovered during the first trimester of pregnancy are functional cysts and resolve spontaneously by the second trimester (18). Persistent masses are most commonly functional cysts or mature cystic teratomas, with the incidence of malignancy reported at 2% to 6% (125). Presenting symptoms of adnexal torsion include an abrupt onset of severe pain lateralized to the right or left lower quadrant of the abdomen, which is commonly associated with nausea and vomiting. Many pathologic diseases of the ovary and/or fallopian tube cause abnormal enlargement, which increases the risk of adnexal torsion. Prolonged torsion of the adnexa may lead to infarction of the fallopian tube and ovary, which if left untreated may ultimately lead to peritonitis and death (72). Complications from adnexal masses such as torsion, rupture, and hemorrhage requiring emergency surgery have been reported to occur in as high as 28% of patients, leading to adverse pregnancy outcomes including spontaneous abortion and preterm delivery in as many as 40% (126). Laparoscopy has become the preferred hemodynamically stable patient (72). 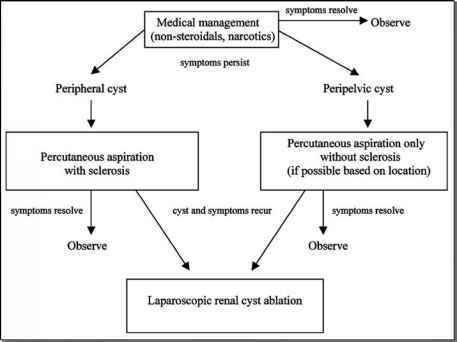 management of adnexal torsion. agement of adnexal torsion (132). Ten percent to 15% of adnexal masses undergo tor sion, and if diagnosed before tissue necrosis, adnexal torsion may be managed laparoscopically with adnexal-sparing laparoscopic detorsion, followed by progesterone therapy if the corpus luteum is removed (133,134). Laparotomy with salpingo-oophorectomy is required for necrosis and peritonitis (88). Previous case reports have demonstrated the safety of laparoscopic surgery performed during pregnancy for the management of adnexal torsion and adnexal mass with good outcomes for both the mother or fetus (131,135-140). Finally, a recent retrospective review, which included 88 pregnant women, examined the maternal and fetal outcomes following laparoscopy versus laparotomy for adnexal pathology in the first two trimesters of pregnancy and found no statistically significant increase in the rate of miscarriages, neonatal malformations, or preterm births between the two groups (17).